1. Process all the ingredients but the chocolate in a blender. 2. Add a few drops of water if you find it too dry. 3. Roll nut-sized balls of the mixture and put them in the fridge while you melt the chocolate over simmering water. 4. 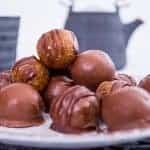 Dip the balls into the chocolate.